Ever been stuck in traffic, only to find out you’d have been better off going a bit out of your way to take a less congested route? If you’re like me, you probably hear the traffic report telling you what you already know: traffic is bad on the road you’re currently on, and you should have taken another. It doesn’t need to be this way, and we want to help. So we’re happy to announce that Google Maps Navigation (Beta) will now automatically route you around traffic. With more than 35 million miles driven by Navigation users every day, this should add up to quite a bit of time saved! On a recent trip to New York, I was running late to meet some friends at the Queens Museum of Art. I had no idea that there was a traffic jam along the route I would normally have taken. Thankfully, Navigation routed me around traffic. I didn’t even have to know that there was a traffic jam on I-495, and I got to enjoy a much faster trip on I-278 instead. Navigation now uses real-time traffic conditions to automatically route you around traffic. Not only can you save time and fuel, you’re making traffic better for everyone else by avoiding traffic jams. Keep in mind that we can’t guarantee that Navigation will be able to find a faster way, but it will always try to get you where you’re going as fast as possible. You can begin routing around traffic with Google Maps Navigation for Android in North America and Europe where both Navigation and real-time traffic data are available. Enjoy your newly found free time! "...and Europe where both Navigation and real-time traffic data are available"
In Norway, at least, navigation isn't available yet... Please, please open up for more countries soon! I always felt like this was some hidden option in google maps that i could never find. I'm really glad its real now! Hopefully this will go to the next step: periodically checking conditions on the drive, and re-routing you around stuff that happens while you're driving. This is great - but unless you updated the way Google determined traffic, it's not going to work well. I've found that Google Maps is often behind with up-to-date traffic conditions, and often times I'll be sitting in bumper-to-bumper traffic, not moving, and Google Maps will list the highway I'm on as "green" in color. I hate to say it, but Bing's traffic works much better. However, I believe they outsource their traffic engine to traffic.com. I would like the option to tell the app whether I want to favor distance or speed. Lately it seems to choose very odd routes, even a nearby interstate provides faster travel if slightly more distance. I don't recall this happening when I originally started using this app, so something has changed in the algorithms and/or one of the updates. It would be nice if Google dropped Navteq, which is notoriously unreliable in the midwest, and picked up using OpenStreetMap for it's map data. Dropping Navteq and tying Google Map Maker into OSM would benefit both Google Maps and OSM mutually. What is the binding time of the re-route? Is it when you start navigating, or is it continuous? If I drive from NY to Ohio, and traffic is jammed 5 hours away from my starting location, it's fair to expect it might clear up before I get to that part of the route. - ability to prioritize speed, distance, or even scenery. But already you have easily the best maps/navigation combo available. Thanks. I believe Google dropped Navteq in the U.S. and many other countries a while ago. Would much rather just be able to re-route manually, like I can on the webapp, given Google's sparse and not particularly timely traffic information in my part of the world. Does this work with Google SMS directions? When will there be real-time traffic data in Spain? Navigation works fine but without that information, this entry is useless. Unfortunately there is no real-time traffic data available in Germany..
has anyone tried it in South Africa? Why don't you get real time traffic data back from the app? Seems to me the navigation app could post back to the cloud what it's current speed and location is, giving much more accurate data. while I love the navigation, this has always bothered me when I'll ignore the directions and it'll drop 10 minutes and change from a red circle to green. I was baffled it wouldn't know to route around traffic since it knows about it! So I very much welcome this update! A few years ago, TomTom introduced a GPS unit that could get updates from other TomToms (with the same feature and paid service) and dynamically reroute in real time. After this Google Maps Navigation update, can't be long before the same option is available. OK, so what is the problem to release Google Navigation to more countries ? The language ? What if I want to use it in english ? Can there please be another option for seeing the traffic colors on the map for red-green color blind people? Remember, we can see traffic signals absolutely fine because of their size and clear division from each other. On the tiny Google Map on the other hand, this becomes v difficult. @Darren Probably so on the outsource... traffic.com actually owns the majority of those roadside sensors... Here in MO.. MODOT started putting them out, but then did a contract with traffic.com so traffic.com owns/deploys the sensors and licences the info to MODOT. Does this take into account traffic AFTER you selected your route? i.e. what if i get directions to somewhere and there's no traffic - and then after i start traveling, something happens and a traffic jam develops. Will it automatically re-route me enroute to avoid the jam? Could you please enable turn-by-turn navigation for Norway soon? This has been promised for a long time now..
Have to agree with Darren. Google maps first needs more up to the minute traffic statistics. 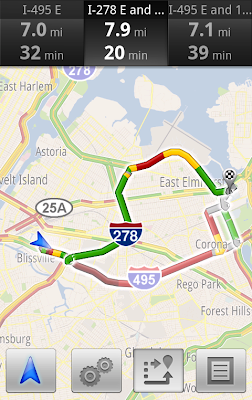 I find that the Google maps traffic info is too far behind actual traffic conditions. I'd love to be routed to the best path now, not the best path an hour ago. New Zealand coverage please. LOL! In the UK it only has traffic info for motorways monitored by the highways agency. Does this work with directions on the iPhone as well? Can we turn off this new feature? Google doesn't know anything about traffic. It often claims terrible traffic when it's flowing fine and claims no problems at all when I'm in a parking lot of a traffic jam. I appreciate the idea, but the data is not reliable enough to not take the most direct route. One feature that commercial GPS units seem to have which is missing is the ability to choose "via" points to change the route arbitrarily, whether or not it's the "best" or "fastest" or uses highways instead of side roads. Obviously, if you choose to drive on a different route, Google Navigation will reroute the remainder of the trip, but I'd like the option of doing this beforehand. Another reason I should have bought an Android device instead of an iPhone! What's new, from my device seeing several alternative routes with traffic has always been there, just one more click away. Now if Google would let you scroll more than 10 recent's from the start screen that would give Garmin something to worry about! How about a device only search, you know from contacts and recents? And yea, I'm talking about using names, street addresses, ZIP codes! But what do I know, I'm just a courier that uses these tools many times a day. Tester application, you know how to get a hold of me! Ever since I heard of Waze I wanted Google to integrate something like this into Maps. Real-time traffic info from thousands of users to help others avoid traffic jams. What happens if the secondary route doesn't have traffic info? Does it still use traffic as a cost comparison between the two routes? I personally don't try to move off of the highways, and drive through side streets unless there will be a big bonus. Hopefully, gmaps won't move me from route A to route B just because it has no idea how busy route B is. @Tom: You're right. Their replacement, though, isn't appreciably better throughout most of the midwest, though; certainly lacking the depth of detail and vetting that can be done by people actually on the ground, which is something OpenStreetMap actually has in the midwest. That, and coverage in most of the countries that Google's current providers are missing. @Rick: Google Maps already reports traffic data back based on people who have it running while they're roaming around. Nice work Google. Best just got better! Will Google Maps continue to monitor traffic while en route and give alternates if the current route becomes congested? So the next feature, to add to google navigation real-time traffic generated from the phones themselves. We have navigation and traffic updates in australia. Will this work here as well? But when Android marketshare reaches a critical mass, Google will create a realtime traffic jam; while the original jam is being cleared !!! My feeling about it echoes Jeff's. Lets say it doesn't work so great. Will we be able to disable this "searching for better route" feature? This just gets me depressed. At least give us turn-by-turn navigation in Norway? On February 18th, there was a BART problem that was a top story on every TV news channel in the SF Bay Area. Guess who was on the train that broke down? Google Navigation for public transit refused to allow me to exclude BART from my searches for routes home to SF from West Oakland station. Where there is no bathroom, no gluten-free food for miles (I have celiac disease) and the rain was pouring down like we were maybe going to need to build an ark. I had to get on the first AC transit bus and ask the driver, and I basically had to take 2 buses to get to a bus that would take me home. I wouldn't be so annoyed about this, but transit.511.org does allow you to exclude a transit system from your searches; unfortunately, it doesn't work particularly well on Android phones. Awesome work, El Goog. I used your software back in August to lead me on a tour of all of the tech HQs in Silicon Valley. Incredible. *When is Latitude integration coming for Navigation? I think Latitude is usually creepy, but would be useful when following friends in another car so as not to get lost. *Also, what about collecting (optionally) map data to improve your database? Same for crowdsourcing the traffic updates? *I like the idea of using open-source map data, but how about using your awesome algorithm skillz to mesh the two datasets (Navteq and OpenStreet)? *How about making some of your theories behind the app publicly available? (in the open-source spirit of Android, of course) I know you have to stay competitive, but you have other ways of doing that. You could tell us, for example, how the re-routing algorithm works! That would be awesome. PS - Contact me if you want to hire me, haha. I can code. come on dont leave sweden hanging! CPHLAX said: come on dont leave sweden hanging! I would like to add my vote for speed limit data being added. When I'm somewhere I've never been it's the main thing I want to know, and it can be ages between signs. Great - this is the feature I've been waiting for! Sweden is a part of Europe but navigation doesn't work here. US receives first because it's the biggest market. Need a version for the laptop. Not only for experimental purpose but for those with less-than adequate phones (or no cell phones at all). Any chance these features could be rolled into Google Maps for mobile? That's nice and all. But where is Maps Navigation for iPhone users? Google has been rolling out apps lately for iPhone and it would be nice to see Google Navigation on the app store soon. I'm not too crazy about the other navigation apps available in the app store, so Google, we're still waiting! @Robert, right on. It would be great to see Google's nav option on the iPhone soon. The other choices for iPhone are lackluster. I'm wondering how accurate it will be. The Traffic option in Layers is very unreliable. It doesn't stay up-to-date with actual road conditions. Maybe this new feature is just designed to route drivers around long-term road construction. It would be really great if the app updated the route as traffic conditions change, particularly for long routes of 30 minutes or more. I would like to have my speed along with the speed limit for the road I'm on displayed. I find it very helpful when I use my garmin which has that feature. It also keeps me from speeding. Congratulations Google! We here at deCarta are thrilled that you have implemented a capability that has existed in our platform and with our customers for over 4 years. Our Connected Navigation devices sold by Best Buy, the Motion X GPS navigation app (the most popular navigation app for the iPhone in the US) and Ford Sync all utilize this capability to create "Traffic Influenced Routes". Of course only as the result of years of usage and feedback by users were we able to tune our engine to deliver the most accurate results so we imagine your service will work as effectively over time as well. Congratulations again for implementing this feature and helping us to educate more users that this is the proper way to handle traffic. @robert: Have you tried Skobbler? It's on the app store. Who do we contact to suggest improvements to the Google Labs people? I would like to see a traffic buttom that allows me to put RED on the screen when I am stopped in traffic. please make navigation avaiable in argentina. Please please please, when is the Navigation going to be launched in India? Please put this feature on the iPhone. What's the Google's strategy of enabling Navigation in the European countries? Plenty of new features for the US customers while no navigation at all for Poland. Google - you have customers outside US too! I'm confused by this announcement. Navigation has already had the alternate routes feature in the screenshot for quite some time. The screenshot is of the alternate routes being called up manually (note the button at the bottom of the screen), and I haven't noticed any new behavior in the last few days. I still find myself having to hit the alternate routes button periodically and checking to see if the other routes are faster. The app spends some seconds fetching times for the alternate routes, and sometimes finds that they're faster. This suggests it's not actually finding the fastest route on its own, until I tell it to. When I press the blue dot it says my location is near Hamburg, Germany. I am in Alexandria, Virginia? What's up? Hi Roy, Great work! I'm currently studying routing in congested networks and was wondering if I can contact you to get some pointers? Google Maps and Navigation is why I have owned an Android phone for the last 16 months. As of last week, it has become useless to me, turning a 43 mile drive into a 62 mile drive. It refuses to recognize that Calif. Hwy. 29 runs from Lower Lake to Calistoga. Fantastic app (best nav program I've ever used). Now it it totally worthless.